MICHAEL VAN GERWEN edged out Michael Smith 7-5, while Chris Dobey earned a 6-6 draw with Mensur Suljovic on a highly-entertaining opening night of the 2019 Unibet Premier League in Newcastle. 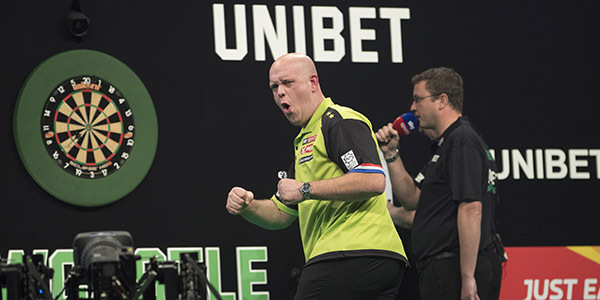 A repeat of the 2018 Premier League and 2018/19 World Championship finals saw reigning champion Van Gerwen begin his campaign with a narrow victory as the road to Play-Offs night at The O2 began at the Utilita Arena. A hard-fought contest saw Smith land the first blow with a 93 checkout to break throw in the opening leg, only for Van Gerwen to break straight back with a 12-dart leg. The Dutchman, who ended the match with a 104.98 average, doubled his advantage with another break to go 4-2 up, but Smith replied in kind immediately to make it 4-3 and then landed a spectacular 150 finish to level it up at 4-4. "Even without Gary Anderson this is going to be a very tough season and to beat a great player in Michael in my first game is the best way to start." Local favourite Dobey was the first Contender to take to the stage and he fought his way to a 6-6 draw against Mensur Suljovic in a spine-tingling atmosphere. Grand Slam of Darts quarter-finalist Dobey's Premier League debut got off to a dream start as he raced into a 5-1 lead, landing a 113 finish in the first leg. 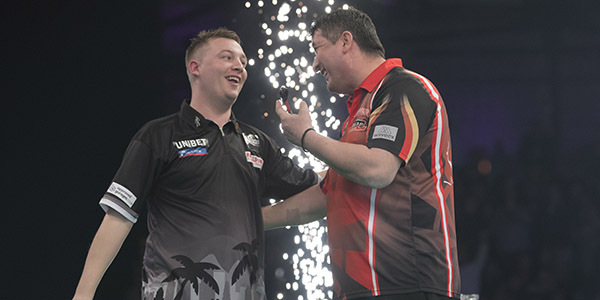 World Matchplay finalist Suljovic battled back, winning five successive legs to go within a leg of victory, only for Dobey to find a crucial double 16 with his last dart in hand to ensure the roller-coaster tie would end in a tie. "It was a dream come true to play in front of that crowd tonight, I felt like Alan Shearer at one point!" said Dobey. 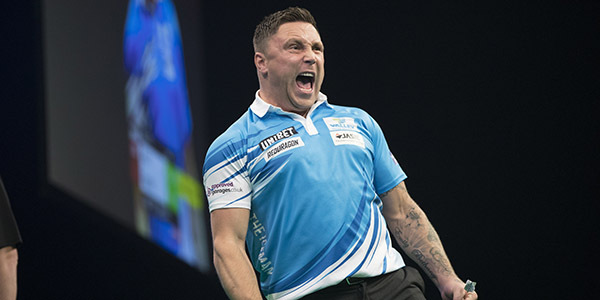 Grand Slam of Darts Champion Gerwyn Price claimed his first Premier League victory with a 7-4 triumph over Daryl Gurney. Price suffered a torrid debut campaign in 2018 ending in an early elimination, and the Welshman once again seemed to be struggling adapt to the Premier League stage as he found himself 2-0 down to Gurney. However, Price ran off five legs in a row to take control of the match, and after Players Champion Gurney missed two darts at double 18 to take the match to a 12th and final leg, Price found his favourite double top to secure a satisfying win. "Last year was a daunting experience for me, so this year I needed to get off to a good start,"said Price, who averaged 104.11 and landed six 180s. "To play the way I did today, with the crowd on my back and everything that's gone on I'm proud of myself and I hope this can be the start of a good campaign for me." 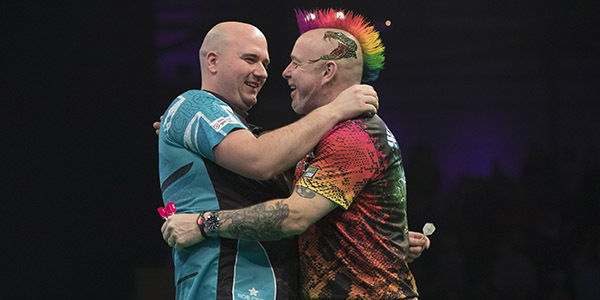 Former World Champion Rob Cross and world number three Peter Wright shared the spoils as the night ended with a 6-6 draw. A sluggish start from Wright saw Cross take a 2-0 advantage, before the Scot sparked into life and landed an 11-darter to make it 3-3. Wright took out 88 on the bullseye to lead for the first time, though neither player was able to land the killer break of throw to win a top-class encounter which saw averages of well over 100 from both. 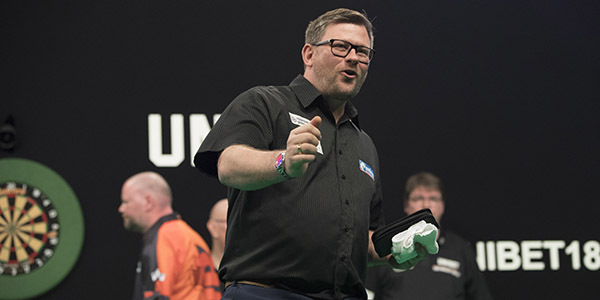 The opening match of the 2019 campaign saw James Wade get the better of Raymond van Barneveld 7-4 in the battle of the former champions. A high-quality opening saw six consecutive holds of throw before Van Barneveld, playing in his final Premier League campaign before retirement, struck the first break with a 14-dart leg to go 4-3 up. That was as good as it got for the Dutchman, as Wade, who kicked off the season with a 180, reeled off four legs thanks to some clinical finishing, ending the contest with a 124 checkout on the bull to make a winning return to the Premier League. "I was so nervous tonight, it felt like my first day at school all over again," said Wade. "I'm happy with the result and a lot of how I played, I felt a bit unlucky to be a break down but I came on strong at the end and it's nice to get off to a winning start." 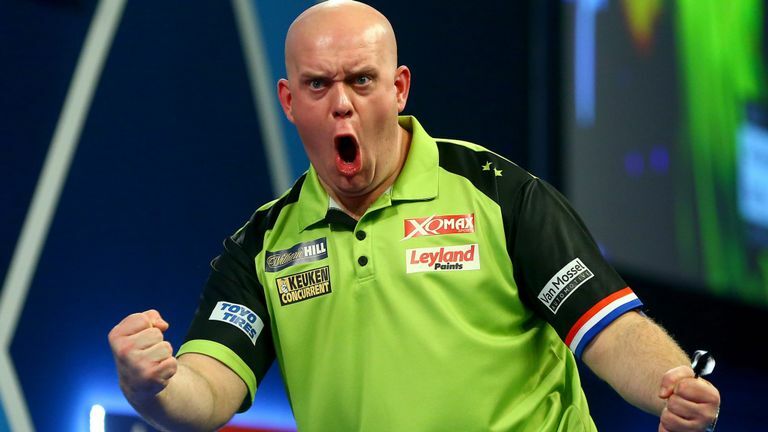 Darts' widest-reaching tournament continues in Glasgow on Thursday February 14 live on Sky Sports, worldwide through the PDC's broadcast partners, and through PDCTV-HD for Rest of the World Subscribers. Night Two will see Van Gerwen take on Suljovic, while three-time Lakeside Champion Glen Durrant makes his Premier League debut against Gurney.